1995. 10" x 11 1/2". 60 signed and numbered copies by Alisa Golden and Anne Schwartzburg (Stevens). Twenty-four pages.This collaboration features poems and linoleum cuts by both artists, and drawings printed from magnesium plates by Anne. The theme is water. 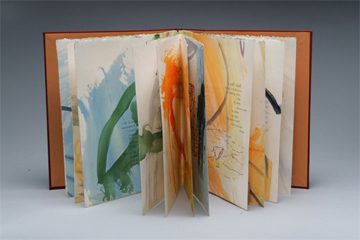 The edition is varied as all pages are handpainted with watercolors, inks, and acrylics to evoke the sea and beach. Letterpress printed from handset type on painted Stonehenge paper. Three signatures are sewn at the mountain folds, giving the book a wavy appearance as it is being read. Museum boards are covered in maroon bookcloth with painted title block and spine strip. Tidal Poems was the first use of painted paper for never mind the press. "agitated sandstone won't / stand still / while the / waves / are / wash / ing & / wearing / the rocks round"
© 2007 Alisa Golden. All rights reserved.